On the campaign trail, President-elect Barack Obama spoke extensively about clean energy, improving the nation's energy security and climate mitigation. As he transitions into the White House, how can he successfully turn this campaign rhetoric into policy? 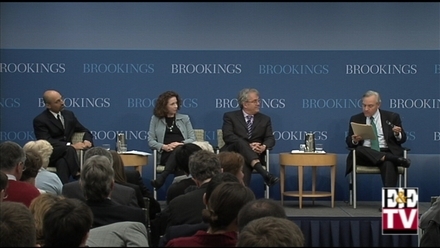 During today's E&ETV Event Coverage of a Brookings Institution event, a panel of energy policy experts gives recommendations to the incoming president on how best to handle cap-and-trade legislation and energy policy. Participants include William Antholis, the institution's managing director; Brookings Senior Fellows Charles Ebinger and E.J. Dionne Jr.; and Suzanne Maloney, a senior fellow at Brookings' Saban Center.